Gold Seal Certified (GSC) credentials set you apart from the competition! The credentials certify your education, experience and competency, and they demonstrate your commitment to the industry and to your career. 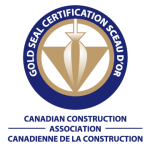 Industry recognized and developed, Gold Seal Certification ensures that both you and your construction projects excel. Learn more about the Gold Seal Certification Program at www.goldsealcertification.com. Join us for a presentation on Gold Seal Certification – from a brief history of the program to the application streams and other components. In addition, learn what qualifications, training and experience you need to write the exam. April 17, 2019 – 9:00 – 10:00 a.m.
All designations: Industry Ethics Course (online and classroom components). Estimators: measurement of construction work, drawings & specifications, construction contracts, pricing/biding, construction documents, regulatory codes, scheduling and communication. Superintendents: management of human resources in the construction industry, construction jobsite controls and planning and scheduling. Foremen: Construction 101 and Leadership in Safety Excellence. *Participants are required to complete the Construction Industry Ethics online course prior to enrolling in the classroom course. Ready to Challenge the Gold Seal Exam? For more information please contact us by email at [email protected] or by phone 604.294.3766.